Roof inspection reports come in as many formats as there are roofing companies. Companies design their own inspection templates, creating a great variety among ways they present their finding. An individual report, therefore, can be difficult to understand, even if you’ve seen one before. Fortunately, although formats differ, the information and terms roofers use is generally the same. A roof inspection report usually begins with some general information. Information in this section includes details on the homeowner’s insurance company and claim (if applicable) and about the roof itself. It can detail the roof’s age, manufacturer, information about the slope and height, roof type, etc. Inspections will also typically include replacement estimates for the whole roof, even if replacement isn’t in the scope of work involved. Reports also typically explain specific costs for repair, as well, if the roofing inspector finds damage. The rest of the report consists of the findings. Roofers explain their findings through written documentation, grid-type diagrams, and photos. This portion of the report can be the most difficult to understand if you’re not familiar with roofing terms. Below are some terms you might encounter and an explanation of what they mean. 3-Tab: Standard asphalt-fiberglass shingles. They are covered with Granules and come in various colors. Architectural Shingle: A premium grade asphalt shingle. It is thicker than a 3-tab shingle and has a distinctive, textured appearance. Also called dimensional or laminate shingles. Breathers: A type of vent that prevents moisture from getting trapped in the roof. They also help equalize pressure between the attic space and outdoor air, which reduces the risk of the roof ballooning in the summing and blowing off during a storm. Breathers are placed on the top or slanted side of a roof. Brittle Test: Determines how easily shingles break. The test simply includes bending a shingle upward. If the shingle breaks (or cracks or is near breaking), the shingles are considered brittle. Fresh shingles will not break. Brittleness is a sign the roof has aged and needs replaced. Buckling: When shingles are curving upward from the middle of a tab (an attached group of shingles). It most often occurs a year or so after a roofing contractor has installed the roof. Usual causes include expanding roof decking, water absorption, and poor attic ventilation. Curling: The edges of the shingles are turning upward. This occurs when a shingle’s asphalt dries out. It’s a sign that the roof is at the end of its useful life, and it reduces a roof’s effectiveness because the singles are not lying flat. Cornice: A horizontal, decorative molding atop a building. Decking: The (typically) wooden cover over the roof beams. This wood creates a stiff support for the roof, and it is what your roof’s waterproofing materials adhere to. Dimensional Shingle: See Architectural Shingle. Downspout: Connects to a house’s gutter and directs water away from the foundation of the house. Drip Edge: A metal or plastic edge that extends beyond the lowest shingles where water drips off your roof. It helps ensure water drips into the gutters and not behind them or under the shingles. Fascia: The vertical frieze or band under a roof edge. The term is also used to describe the outer edge of a cornice. Felt: Sheeting applied under shingles and atop decking that repels water and protects your roof in case of shingle loss. They are also used when evaluating shingles’ fire ratings. Roofing felt is also called roofing felt underlayment, roofing tar paper, or roll roofing. Felt is made of a natural or synthetic base and covered with a protective coating like asphalt. Flashing: Material used to cover joints in a roof, such as where the roof meets the chimney and where the roof meets at an angle. Gaskets: A seal used for vents, skylights, and other openings in the roof. They are typically made of a rubber-like material. Granules: The gravel-like beads that cover asphalt shingles. They protect the shingle asphalt from direct exposure from sunlight and from mechanical damage (e.g. hail or fallen branches). Gutter: Diverts water that trips off your roof to a downspout. Gutters keep water from washing down the side of your house and flooding your crawl space or basement. Heads: The top of something. 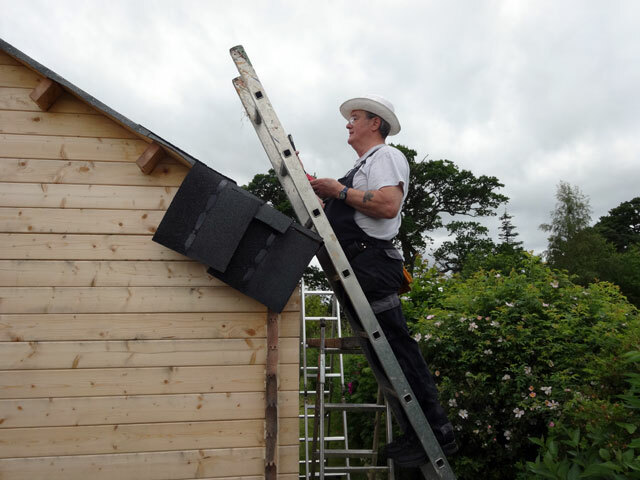 Hip Cap: A type of shingle specially made for placement over a roof peak (where vertical edges of a roof meet). They are also called ridge caps. Insulation: The material in the attic space that helps regulate the indoor environment. It is what keeps warm air from escaping in the winter and entering in the summer. Laminate Shingle: See Architectural Shingle. Membrane: Roofing material made from synthetic rubber, thermoplastic, or modified bitumen. They are typically used for flat roofs in commercial sectors but are not uncommon for residential roofs. Molding: A decorative, architectural feature on the roof. Oil Canning: Slight waviness or deformation of metal panels, especially in flat areas. Unless oil canning occurs because of extreme stress, it usually doesn’t imply any structural problems. OSB: Oriented Strand Board. It is a common plywood alternative and used for roof decking. Plank Sheathing: Decking made from long, wooden planks. It was used before plywood became standard. Ridge Cap: See Hip Cap. Rivets: A metal pin or bolt that goes through two metal plates. Once pressed through, the headless side is beaten or otherwise pressed down, which secures the pin. Shingles: Overlapping sheets, tiles, or shakes placed on a roof to protect it from water and mechanical forces (e.g. hail, fallen limbs). Shingles are made from a variety of materials, including stone, clay (tile), wood, asphalt, fiberglass, and metal alloys. Skylight: A window cut into the roof. Slope: How much a roof’s height increases over a given length. Soffit: The underside of an architectural element such as an arch, balcony, or overhang. May refer, specifically, to vinyl soffit material. Tab: A single strip of 3-Tab asphalt shingle. Tongue and Groove: A type of decking in which the wood pieces are cut to fit into each other.